I've been wanting to do a giveaway for a few months now, but between moving and starting a new job, I just haven't had the chance. 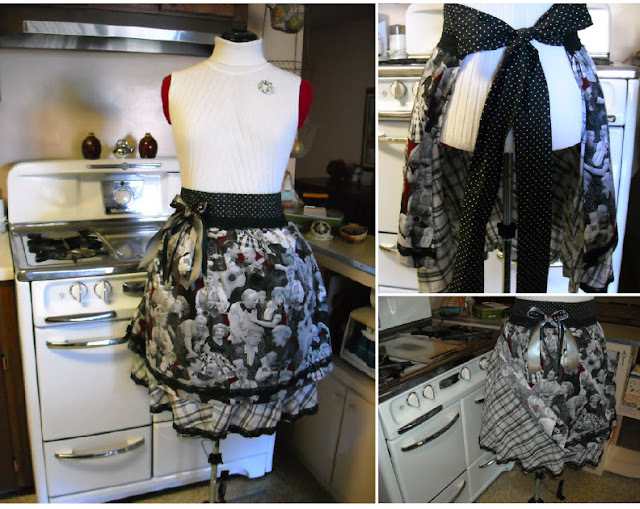 I was browsing Etsy and came across The Lily Parlour's "I Love Lucy" handmade apron, and I fell.in.love. How could I not? Who doesn't want to put on an ILL apron with their red heels and cook meatloaf? The designer, Lily, was kind enough to send me one of these aprons for one special person to enjoy. Her aprons are one-of-a-kind, so you won't find them anywhere else. The picture above is of her previous ILL apron, but the one I'm sending out is actually trimmed with red lace and has a front pocket. What's your favorite fall treat/guilty pleasure? I will announce the winner on Saturday morning, October 15th, using random.org. caramel macchiato from starbucks :) ive snuck two in this week alone..the cooler weather makes my body crave it! what a fantastic giveaway, I would LOVE my I Love Lucy apron! thanks rach! Starbucks pumpkin spice latte! can't get enough! definitely pumpkin pie! and a pumpkin spice latte (w/ a extra shot of espresso! of course) and pumpkin picking . . . basically anything involving pumpkins? Candy corn. I love the stuff! Pumpkin Spice Latte from Starbucks! Nothing screams FALL like this liquid deliciousness! That apron is adorable! My favorite fall treat is anything pumpkin - pie, coffee, cookies :) love fall, its my favorite time of year! Hope you're doing well, I miss you! I love that apron!Its so neat.Also my favorite fall guilty pleasure treat is homemade dutch apple pie with vanilla ice cream, so yummy! My guilty pleasure is whenever I buy Halloween candy I end up eating a good part of it. My favourite treat of Fall is my mom's pumpkin pie with dollops of her homemade whipped cream!! I haven't been able to make a pie comparing to her's but I hope to one day be able to! Yay for give-aways! My fave fall treat is pumpkin bars with cream cheese frosting. As of last weekend, I have a new Fall favorite... pumpkin cobbler topped with vanilla ice cream. It is definitely ALL KINDS OF YUMM!!!!!!! Ok so I love all the pumpkin stuff as much as everybody else but every fall I HAVE to make huge vats of tomato basil soup with feta cheese.. yum! And I love that apron lol! My fav fall treat are the honey crisp apples...although they are a healthy, not guilty, pleasure. I love your site Rachel!! you are such a wonderful cook and i just love trying out the new fun recipes you post. My favorite fall guilty pleasure would be pumpkin spice bars! they're so yummy!! especially with a little vanilla ice cream to top them off. Guilty indeed! My favorite fall guilty pleasure if hot chocolate (with marshmallows, of course)! favorite fall treat? pumpkin shaped Reeces! OH so yummy! Okay, well ... you know those giant bags of candy they sell in the stores? The mixed bags for Halloween? That would have to be my favorite fall treat, because I can essentially buy candy in bulk without looking like a complete chocoholic! caribou coffee has a white chocolate mocha pumpkin cooler that is so so good. My favorite fall treat/ guilty pleasure is pumpkin pie topped with whipped cream. Yummy! i definitely indulge too much in pumpkin treats! pumpkin pie, cookies, bread, you name it! Pumpbars - w/ cream cheese frosting. love it! love the apron! thanks! Pecan pie is my favorite fall treat! Gee, I love warm brownies and vanilla ice cream with a little chocolate syryp on top! Yummy! I love oreos baked into chocolate chip cookies! warm chai lattes or apple cider! I love all of the tasty things that come with fall- pumpkin pie, apple cider and especially pumpkin spice lattes & frappuccinos! I love making anything pumpkin spice, but I also love cider! I dont know what it is about the fall that makes your crave warm veggie soup with fat yeast bread, but yummmm! Also love to make pumpkin rolls with cream cheese middles. Cant forget all the halloween candies! My guilty pleasure is a drink called Spotted Cow. It's half hot chocolate, and half french vanilla cappuccino with whipped cream, caramel and chocolate. They're SOOOOO good. My favorite fall treat is Apple Cake (I make this every year for Thanksgiving) along with a cup of Hot Caramel Apple Cider. Yummy! Stir fried apples, sliced cooked in butter in a skillet, pinch of salt, with sugar/cinnamon and a pinch of nutmeg added right at the end of cooking (till tender), served with hot buttered bisciuts. mmmm heavenly. My favorite fall treat is chocolate chip pumpkin bread with glazed icing!!! YUMMY! I love apple pies and pumkin pies with vanilla ice cream. My favorite! Carmel Pears rolled in crushed Heath Bars,VERY yummy!!! OOo. fall treat. Hmm. Well I love banana chocolate chip cookies all year long! My favorite Fall treat is Pecan Pie, especially chocolate pecan pie. yum yum yum. Thanks for the chance. My favourite fall treat is definitely pumpkin cupcakes with cream cheese icing. Thank you for the chance to win this lovely apron. I have an incredibly delicious, sugar free recipe for BAKED APPLES. Fall is not Fall until I start baking a dozen of these, for family and company. Thanks so much for the fantastic I Love Lucy giveaway. She never fails to put a smile in my heart. Happy Fall to all. I love caramel apples this time of year! Caramel apple lollipops! They're only made during the next two months. I have a bag in my cupboard right now!